Dispatches from Midwinter – Midwinter for Students and New Professionals: Worth the Investment? I attended my first national library conference last summer at ALA Annual in Anaheim as the Student to Staff representative from St. Catherine University. 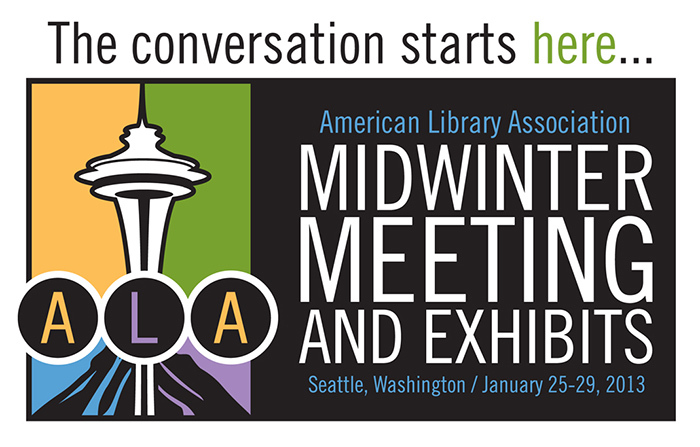 I knew right away that I’d become a library conference junkie, so I was easily convinced to attend last month’s ALA Midwinter Meeting in Seattle. I knew that Midwinter was going to be a different experience from Annual since it’s focused on meetings and getting work done. As a recent library school graduate, I’m still working my way into professional participation and am not yet on any committees. Would Midwinter be a productive experience for me? Now that I’m back, I can definitely recommend Midwinter attendance for motivated students and new professionals. The least quantifiable and most enjoyable thing about Annual, as I wrote in a blog post for my student chapter, was the feeling that librarianship is the center of the universe. I found this to be the case at Midwinter as much as at Annual. I can’t stress enough how important I think it is for librarians of all ages to experience that feeling. In so much of our professional lives, we find ourselves underestimated and misunderstood, and public librarians in particular deal with a whole range of unsavory tasks (e.g., a recent week when I was at two different libraries that were dealing with projectile vomiting). Being celebrated and appreciated while spending time in the company of peers who understand, without explanation, what your professional life means, is a balm and a relief. This works for students as well as librarians who are further along in their careers—newbies can attend introductory sessions and get mentoring not only from NMRT but also just by talking to working librarians at the conference, who are often more than willing to offer guidance. Which brings me to the most important part of the Annual or Midwinter experience: networking. Although Midwinter typically brings in half the participants of Annual, what the online statistics don’t tell you is that library leadership is disproportionately represented at Midwinter as dedicated professionals come to attend multiple and sometimes days-long committee meetings. By far, the recommendation I heard the most before attending Midwinter was that I should go to open meetings and see how the sausage is made (so to speak). That knowledge not only gives you an in when volunteering but also sets you apart as division and round table leaders will remember the face of that visiting student. However, I found official networking events even more productive for meeting and talking to library leaders. At the ASCLA luncheon, for example, I met a consultant who was looking for librarians to visit her Colorado public library system for a few days of paid cataloging, possibly a great opportunity for some of my fellow students. At the YALSA happy hour, I connected with the youth services manager of my local public library system, who introduced me to organizational leaders. Finally, if you’re into getting ARCs (Advance Reader Copies of books, for those not in the know), I personally found it much easier to collect them at Midwinter than at Annual. At Annual, I was able to get into the exhibit hall early because I was working for Cognotes, and I made the mistake of walking in front of the hall doors as they were opening for the first time. After being nearly trampled by overexcited book hounds, I decided that I would not make that mistake again. While a big crowd did gather for the opening at Midwinter, it wasn’t nearly so hectic, and the stacks of free books were much easier to access with a lot less stress. *Just a note about the PLA Grant. The winner has to attend a PLA Conference or Preconference/Institute at Annual Conference or Midwinter Meeting.